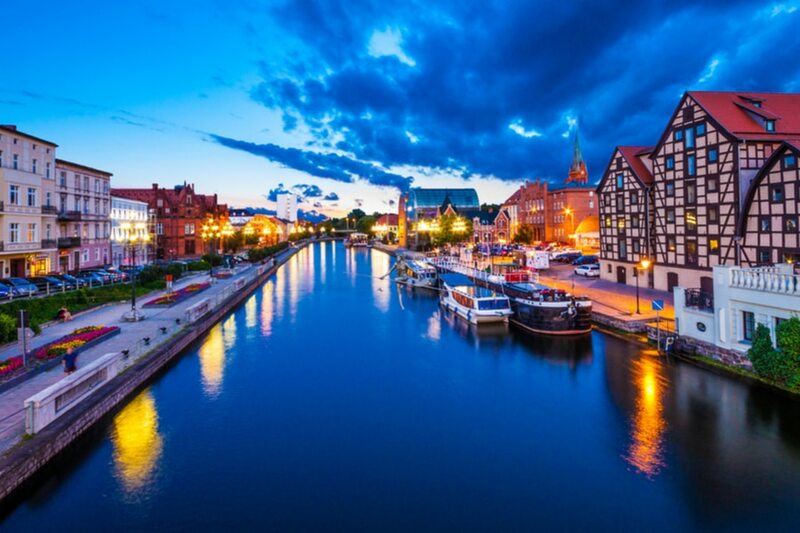 Located in northern Poland, Bydgoszcz (pronounced Beed-Goshed) is known as “the Venice” of Poland. Its beautiful red brick buildings, mouth-watering Polish cuisine, laid-back atmosphere and youthful vibes are some of the reasons why the city is one of the country’s best destinations. If you’re a first-time visitor, with only 2 days, planning the trip and narrowing down what you should see and do can be a daunting task. 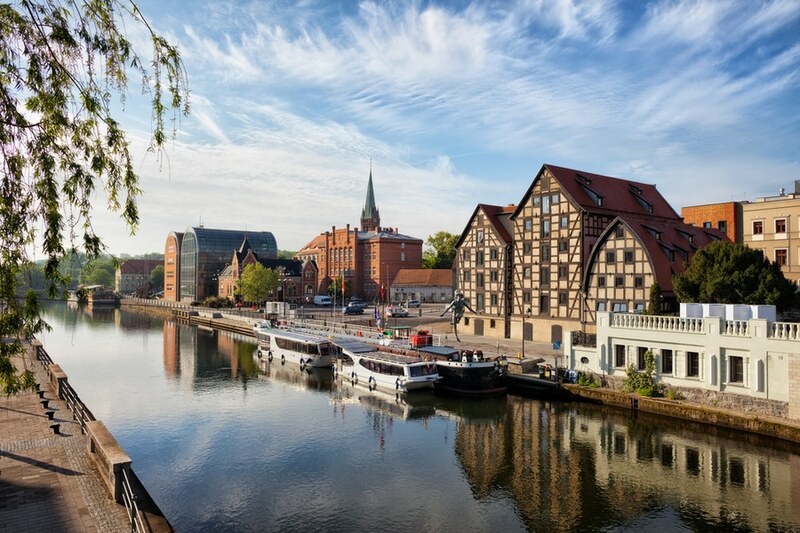 With our suggested itinerary, your visit to Bydgoszcz will be relaxed, and you’ll get a greater sense of its attractions, its food and its people. You can absolutely fine tune this itinerary to adapt the tour to your preference. Language – Polish language is the official language of Poland, which is spoken by majority of the population. Younger Polish in the city and other main tourists’ spots, speak English so you can absolutely get by without speaking Polish language. Like other countries, speaking at least some Polish phrases or attempting to learn is greatly appreciated by the locals. Transportation – Getting around Bydgoszcz and the rest of Poland is fairly easy. The city is quite compact so visitors can easily explore its tourist attractions on foot. If you are short on time or you prefer less time walking, Bydgoszcz has efficient bus and tram transport network. You can also bike on your own or join one of the guided biking tours offered in the city. Renting a car and driving on your own is not recommended because of traffic and limited parking spaces. 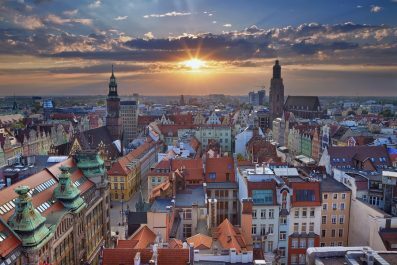 Accommodation – There’s a great variety of accommodation in Bydgoszcz, ranging from small family-run pensions to five-star luxury hotels. In almost any neighborhood, there’s something for every level of comfort and budget. If its your first time in the city, it is recommended to stay in the town center to get easy access to the city’s famous attractions and get plenty of accommodation and dining options. 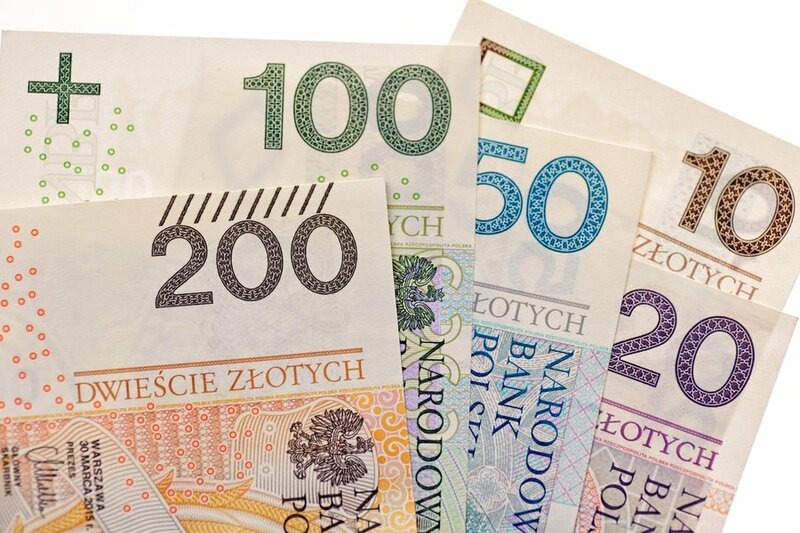 If you are coming directly from Warsaw, then you can travel to Bydgoszcz by train or by bus. By Express InterCity, it only takes 1 hour and 30 minutes to get to Bydgoszcz Główna Railway Station from Warsaw Railway Station. For time table and ticket information, visit PKP InterCity’s website. From the train station, take a bus or tram (trams number 3 and 5) to get to your chosen accommodation. There is no better way to get acquainted in the city than walking along the historic Bydgoszcz Old Town. Head to the Bydgoszcz Market Square, one of the best medieval squares in Poland and the whole Europe. It might look like a typical European market square, but this market square has witness terrible things in the WWII. Pay respect at the Bydgoszcz Land Fight and Martyrdom Monument, where the local residents were executed during the Nazi invasion. Next stop is the Cathedral of Saints Martin and Nicholas, also known as Bydgoszcz. 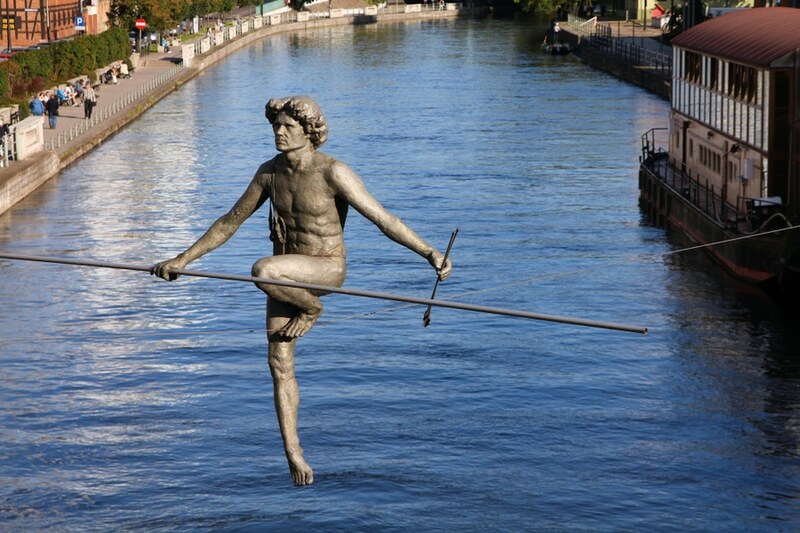 Do not miss tot ake a photo of this unique statues, Tightrope Walker Sculpture, smoothly balancing on the rope above the River Brda. On the other side of the river, you will find Mill’s Island (Wyspa Mlynska), a 6.5-hectare green oasis home to cultural and recreational buildings. Here you will also find the 18th century White Granary now home to the archaeological collections of the District Museum. Also, not to be missed is the iconic three old granaries on Grodzka Street. 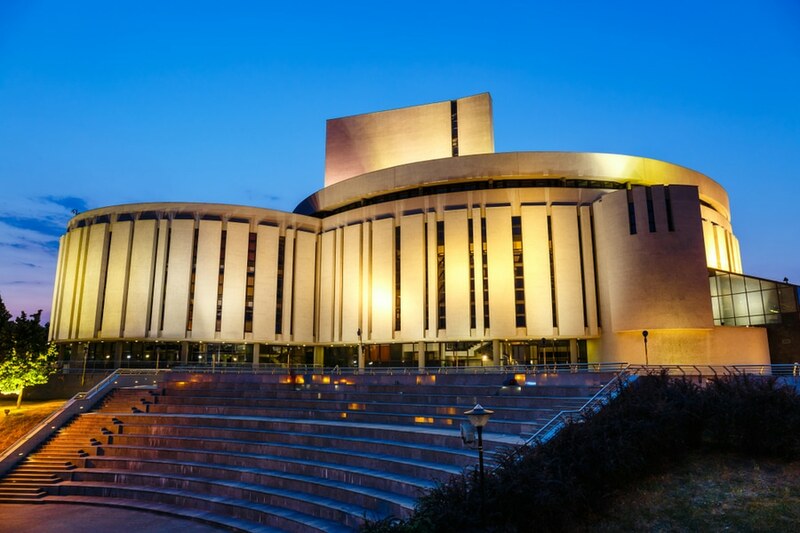 In the evening, you may watch a world class theatrical performance in Opera Nova. For performance schedule and ticket prices, visit their official website. You may also watch symphonic and recitals at the famous Filharmonia Pomorska (Pomeranian Philharmonic). For concert schedule and ticket prices, please visit their website. 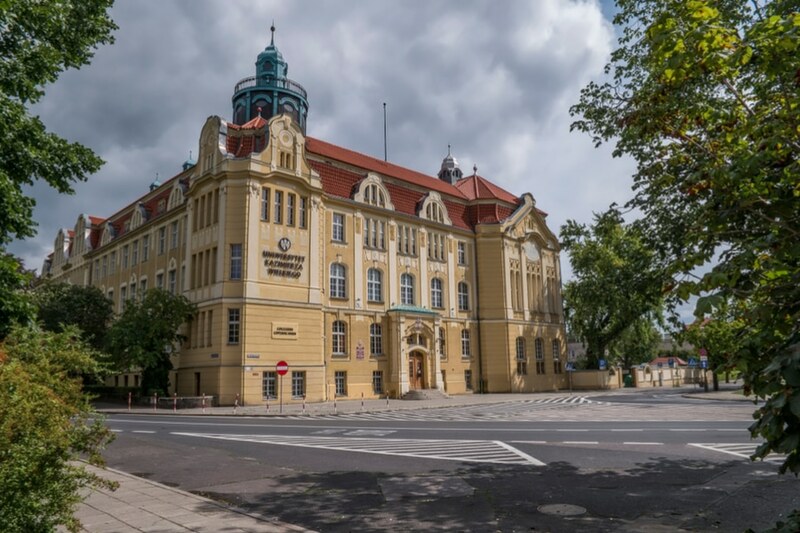 You can dedicate this day to one or two the city’s most famed universities like the Kazimierz Wielki University (Casimir the Great University) and Uniwersytet Technologiczno-Przyrodniczy w Bydgoszczy (University of Technology and Life Sciences). After your university tour, head to Exploseum, one of the most well-known museums in Poland. Located outside the Old Town in a somewhat forgotten building, it is a great testament to the horrors brought by the Nazi invasion. Not only it presents Jewish culture and history, it also commemorates victims of the Holocaust. Do not leave the city without visiting its number 1 attraction, Museum of Soap and History of Dirt. This unique museum showcases medieval baths, 19th century bathing room, the world’s first portable toilet, among others. You can also create your own soap at the museum’s workshop area. For some souvenir shopping, go to Bydgoszcz Soap Manufacture, where you can buy artisanal soaps, scrubs and bath salts, and many more! Have you been to Bydgoszcz or anywhere else in Poland? Do you have any tips or suggestions to share? If so, you can leave your comments below.